I don't have any chickens so I thought I would paint a wooden duck this week. It is another OPEN - CLOSED sign. 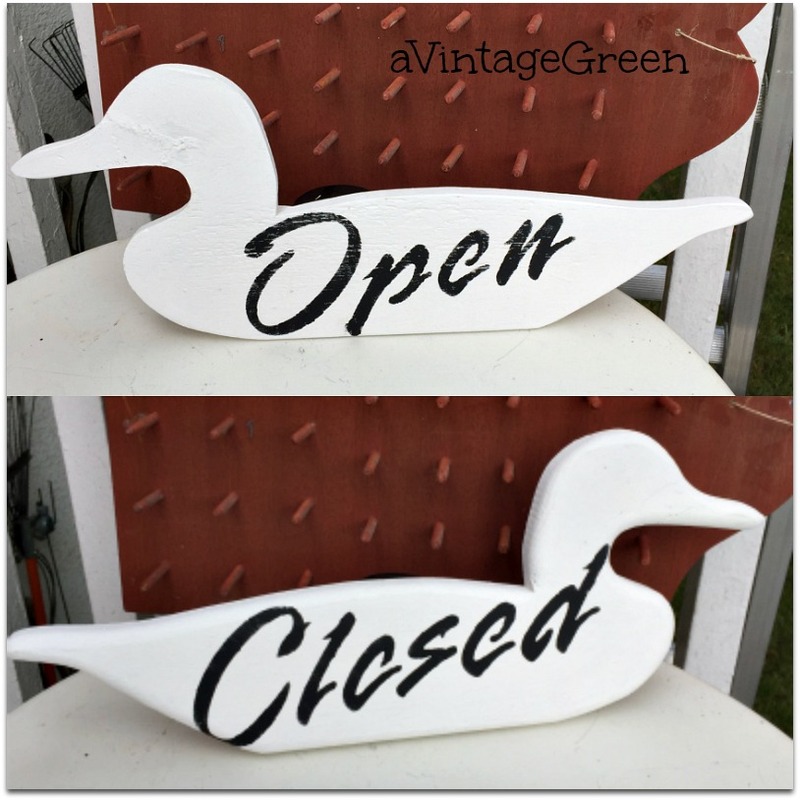 After trying the Open/Closed on the natural finished duck I tried again - this time painting the duck in white and adding Open/Closed in black. Prep done for back wooden deck. Washed, squished cherries cleaned up. Dry rot. Wait. Dry rot. Well, here is the before and after (so you know that one board has been removed and replaced with a new, painted board). DH did this job. The nails were 4 inches long and rusted right in. Used various saws, pry bars, and a lot of muscle to get that board OUT. 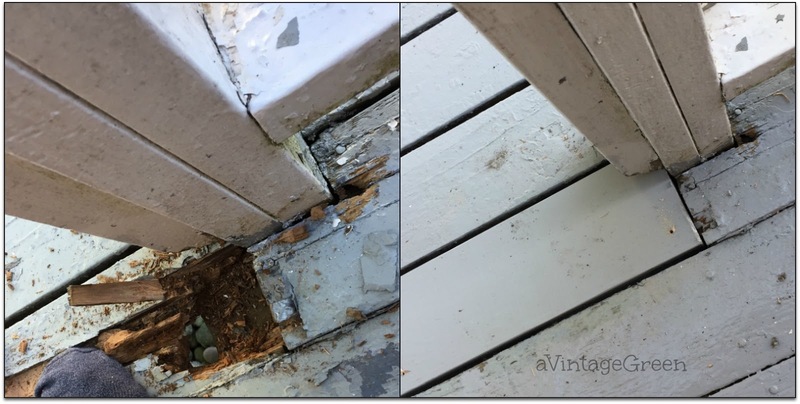 The replacement board was cut to size, painted, screw placement holes pre-drilled (measured where the rafters were from the board that was removed). Fortunately the rafters are ok. Checked. Couldn't resist making a collage (but you can skip it if you don't like sequence of repair pictures. The deck boards have been painted once and will get another coat AFTER I remove the rest of the 'stuff' from the rest of the deck. Here is the deck LAST YEAR after it was cleaned, repaired and painted. 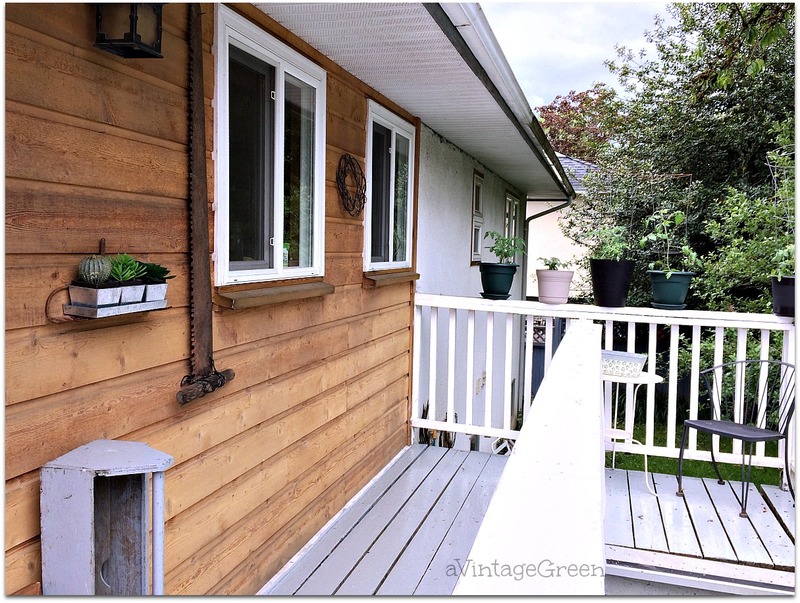 (this year another coat of deck paint needs be added and the white rails will also be painted. 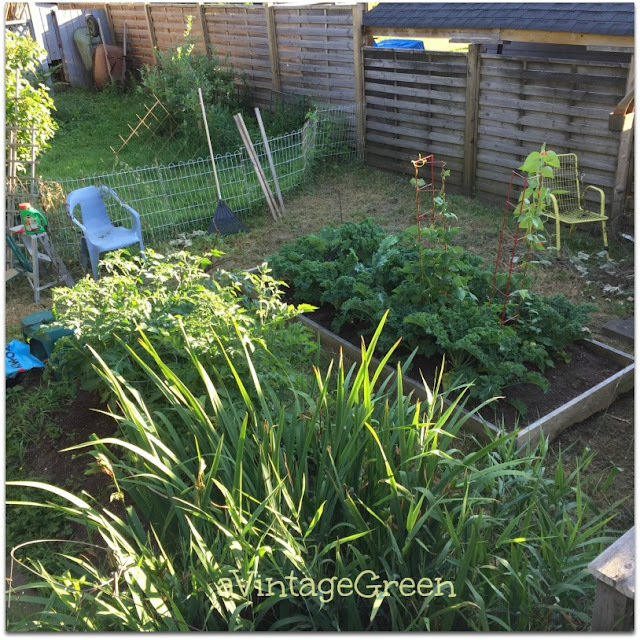 I weed-eated the rather overgrown weeds and vines and grass in my small garden area on Tuesday. 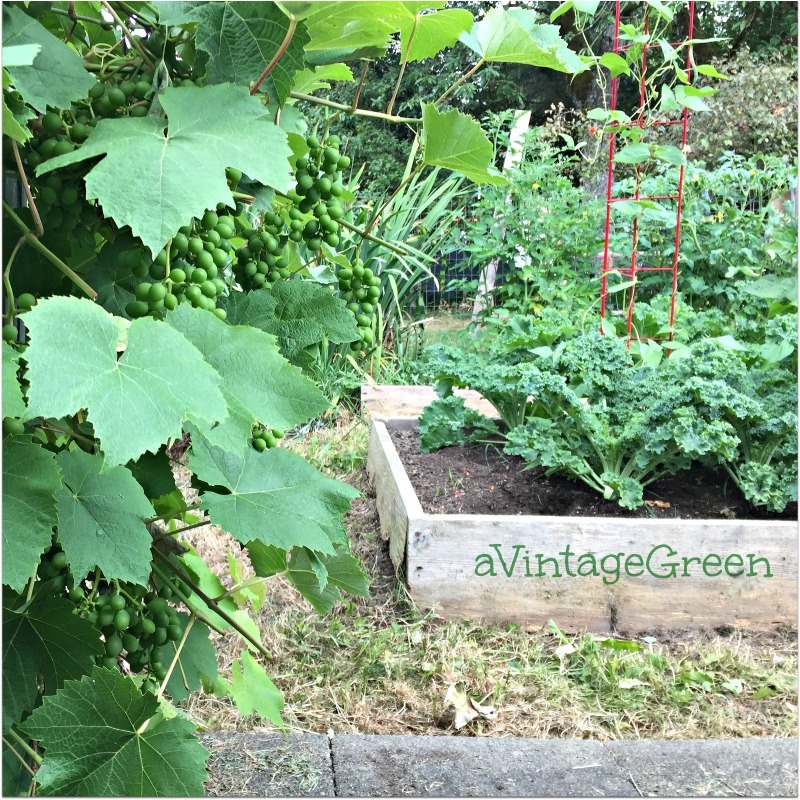 Cut back the grape vines. Cut back the rose with the HUGE thorns considerably since the flowers were over (plus it jagged me several times every time I went out to pick Kale for my morning smoothie). More work to be done (always). Trimmed apple tree, ornamental cheery tree, the bush the dogs have their 'dens' dug under and anything else I could find that needed to be tidied. Filled 4 large brown paper garden waste bags. Tripped over a vine covered wire plant wire support so pulled them all to one area to clean and put away safely, a job on my 'to do' list. I was watching Peaches Thursday afternoon (she hurt her leg and needed to wear a 'cone' unless she was in sight and NOT touching her leg). I followed her around, with my plastic chair and clippers and small tree saw for two hours and trimmed branches, pulled weeds, picked up sticks and branches, raked grass I had weed-eated earlier, just kept very busy while Peaches had a peaceful time in the backyard checking out every spot twice, every pile of dirt that the moles made, as well as rested in her favorite spots, all without touching her sore leg. So far 10 brown bags (6 from front yard work) are ready to go to the plant/recycle into soil area at the Municipal Dump. Kale is tender. Beans have flowered and are forming beans. Tomatoes are green (I planted them too close together). Grapes are getting bigger. We had a 15 foot long, dead branch, removed from the giant cherry tree - dented the ground when it landed. Guy who did the work was great - he had a heavy 30 foot pole with a battery operated motor at one end and a small chain saw at the other end - he had that branch down and ground to chips and was gone less than half an hour. No pictures since I wasn't home to watch. 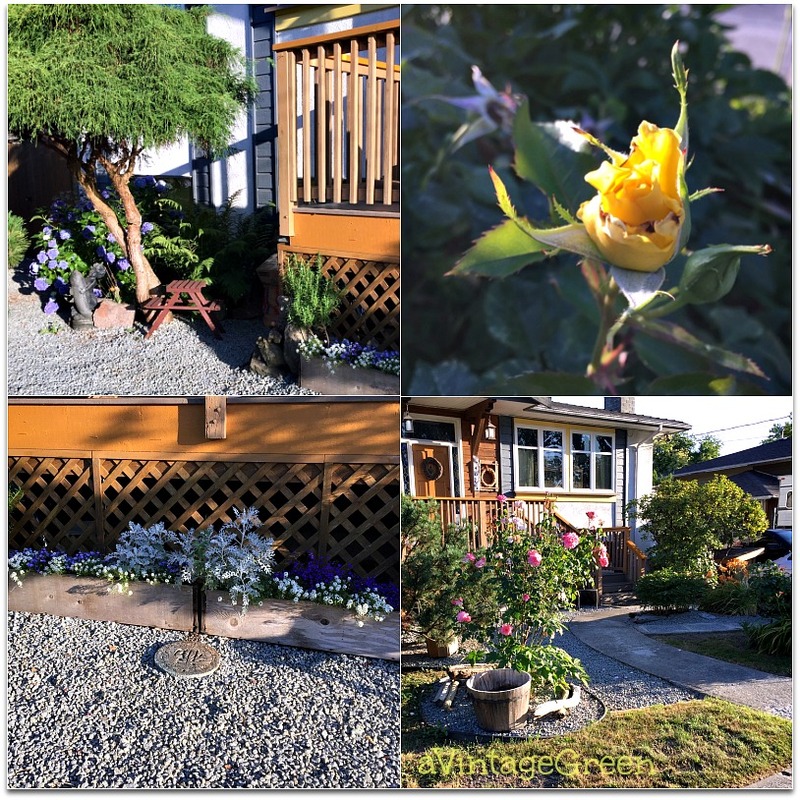 Roses are 'mostly' blooming, June was really 'their' month. Hydrangea is wonderful. Fern is thriving. Planters are doing well. Sidewalk and driveway widening finished. Much more to do, but I am out there weeding and clipping and raking and weed-eating (instead of mowing) because the grass got SO long !!! 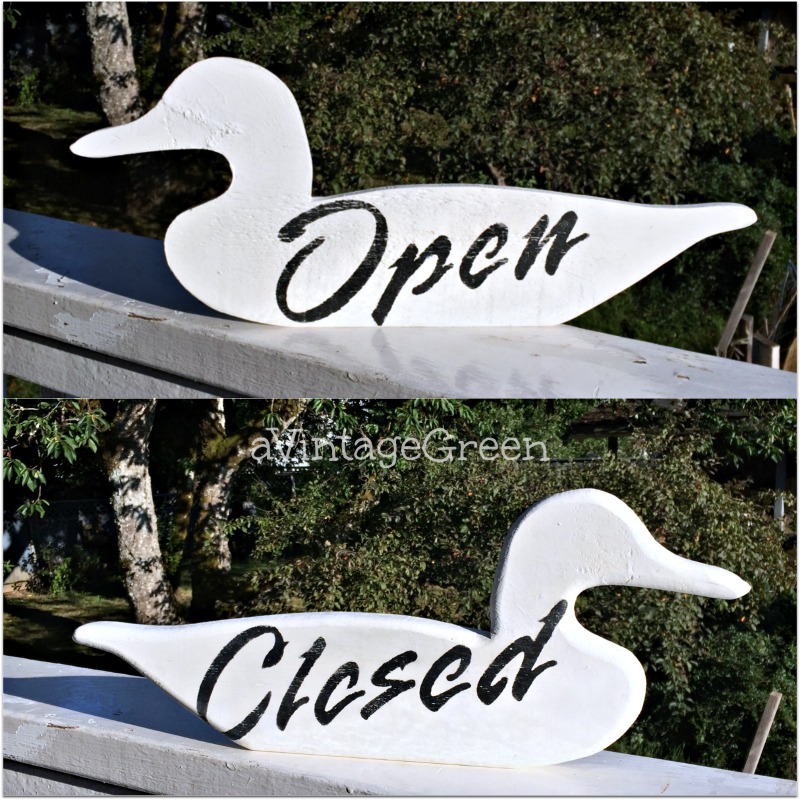 Duck signs - a bit of fun. It looks so good around your place! There’s always so much to do! It’s the same way here. I’m forever trying to catch up on things that need to be done but I guess that’s the way life is. It’s triple digits for the next 10 days so I’m giving up on some of my flowers. From now on, I’m going to plant only Texas hardy things and mostly bushes and ground cover. I can’t keep up with trying to keep things alive! However, the St. Augustine grass is beautiful! Lush, green and healthy and best of all - spreading! Always something to be thankful for! Joy, Love the green of your garden. Looks lovely. 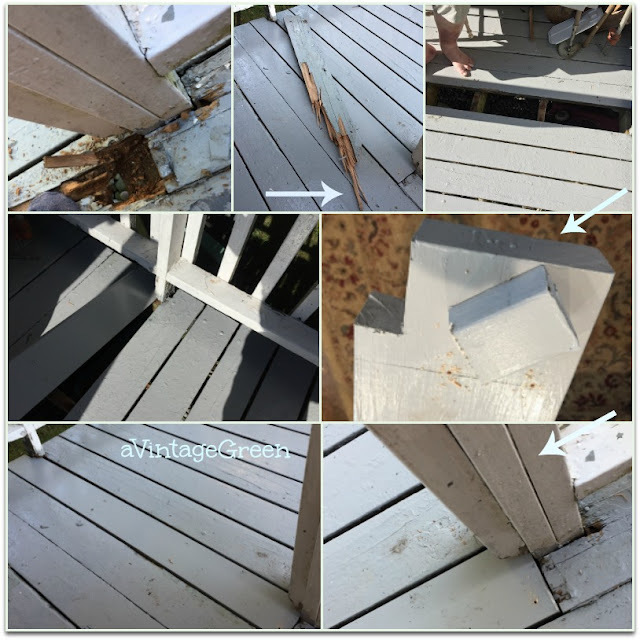 The deck repair is necessary and great that it got done. The widening of the sidewalk and driveway - another project. You have been busy! Thanks for sharing. Have a great week. Sylvia D.
Love the white/black duck, rustic but still stylish. You have been busy out in your garden, time for a rest now n'est pas? Lie back, relax and read a book with an ice cold beverage to hand. That's my plan for this week and maybe the week after that too. Love the black/white duck sign. Your garden is lovely. You've been busy! Beautiful. The ducks turned out really cute! And your flowers are lovely. Everything looks very nice for enjoying this summer! Staying on top of yard work is a constant job in the summer. It feels good when you can see the things you've accomplished. Cute duck. 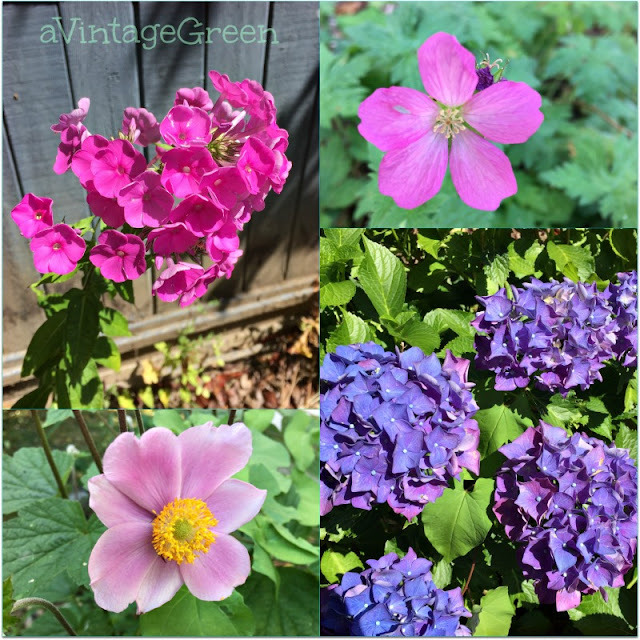 You reminded this former garden-keeper of how much work it is to keep a beautiful yard in the summer ... your flowers are so lovely; thank you for sharing especially now that I don't have my own! Gardening is a never ending duty. I love it, but boy it's been too hot here lately to do much. 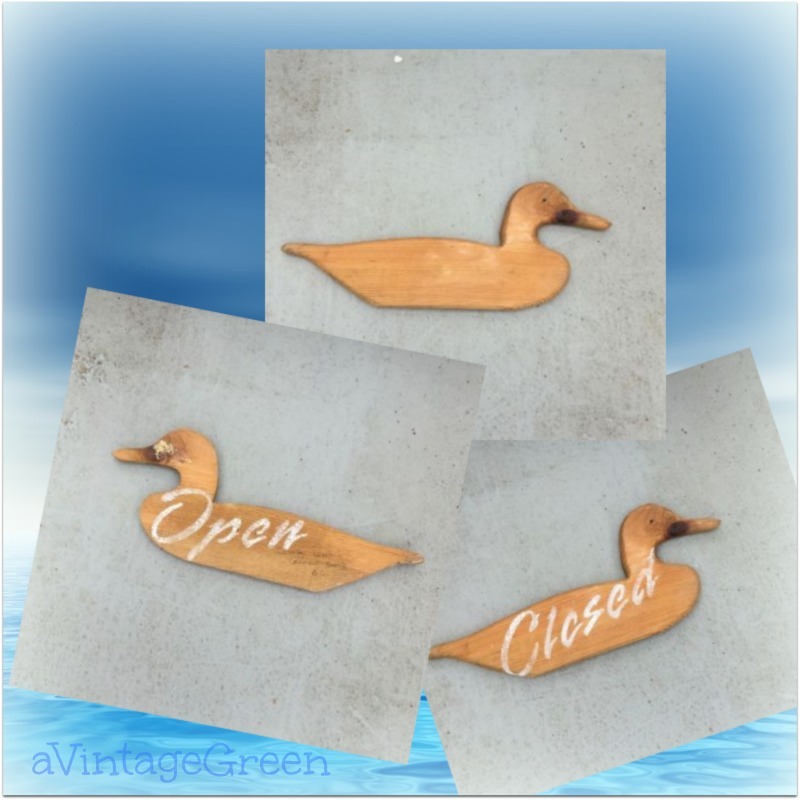 Love the duck signs! Thanks for sharing with SYC. You have been busy! 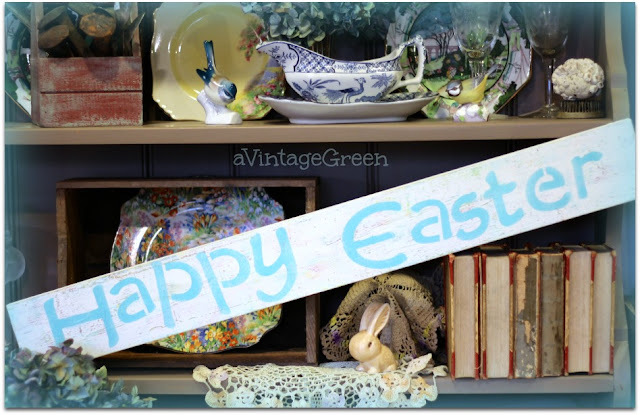 The duck sign is so cute, and your gardens look amazing. Too hot here in TX to spend much time in the garden. I try to work an hour or so early morning, mostly watering to help things survive the day. Sit back and relax now. You deserve it. Nice to catch up with you. That deck--we've got some of that kind of work to do too. Not looking forward to it. The finds look great, and so does the garden. Cute idea! Thanks for sharing at To Grandma's House We Go DIY, Crafts, Recipes and More Wednesday Link party! Pinned! Hope to see you next time!